Because of that, at least in part, dogs know that we have more “social freedom” than they do, and much of their life is dependent on how we use it. Let me be anthropomorphic for a moment . . .not always a good thing, true, but sometimes useful. If you were dependent upon someone else, how would you like them to behave? Think of a great boss, or a great teacher or ideal parent. Wouldn’t they be a person who 1) was clear and consistent, 2) established clear and reasonable boundaries and 3) saw you for who you really are, and acted in ways to bring out the best of you and inhibit your dark side? I think that insecure dogs especially are in need of people who teach them to be patient and polite, who help them learn to inhibit impulsive behavior, and to establish boundaries in a fair and clear way so that everyone knows what to expect. We know that part of what makes a social animal nervous and insecure is a lack of ability to predict what is going to happen to them. And more than that, I think insecure dogs need a sense that their human is someone that they can count on, to take charge and get them out of trouble when necessary, and to create clear and fair boundaries that help them learn emotional control. I have seen so many dogs in my office whose owners adored them, but who were afraid to deny them anything. No boundaries, no rules beyond “please don’t pee in the house.” I had one client whose dog began to growl at her because she didn’t get up out of her chair and go across the room to pick up a toy for the dog. This particular dog had taught his human, literally, to fetch for him, and if she didn’t pick up on his cues fast enough to pick up his toy and hand it to him, he began to growl and threaten her. And yet, I got no sense that this was a happy dog. You might think that he was in heaven, living in some kind of canine fantasy with a person who waited on him hand and foot. But he was nervous and insecure, and after we started using positive reinforcement to teach him other ways to behave, and decided on some reasonable boundaries, he not only stopped bullying his owner, he seemed like a much happier dog. And so, although I have concerns about what the word means to some people, I still use the term “benevolent leader,” in the belief that most dogs are relieved to be able to count on their human to, as one dictionary defines “to lead,” to “guide something along the way.” That’s not a bad thing to do for the animals who are so dependent upon us. We just need to do it with love, patience, benevolence and most of all–a good sense of humor. Meanwhile, back on the farm: It’s exquisite spring weather, 60’s and sunny and all emerald green grass and liquid bird song. Here are 2 of the 3 bottle lambs that Truffles doesn’t make enough milk for. They are just starting to frolic after getting their bellies full of goat milk. And here are the 3 ewes who lambed most recently. The rest of the flock has dashed up the hill for 2 acres of clover and grasses, while these 3 stay closer to the barn. That’s Truffles, the ewe with the problem udder, on the left. 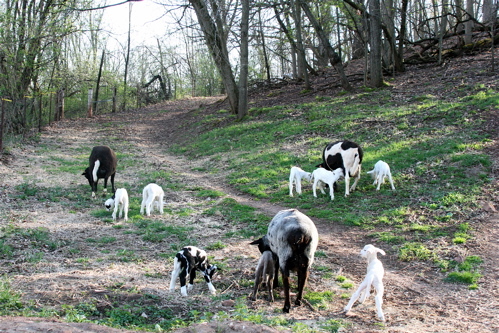 Her 3 lambs are the ones on the left too, although the one with the most black is in the foreground. Dorothy is in the middle with her twin lambs, while Snickers is on the right with her all white triplets. Snickers and Dorothy are especially cautious about leaving the safety of the barn. Dorothy is so cautious that I have to feed her separately because she is hesitant to leave the barn to feed with the others. Her lambs are tiny, tiny tiny tiny, but their little bellies are full when I check on them. I gave Dorothy extra grain last night because I’m a tad worried that she isn’t getting enough food. As I write this they are all at the top of the hill on an Irish green pasture. I can almost hear them tearing the tips of the grass off as I write . . .
Just wanted to say that, I’ve enjoyed this series of posts. I haven’t been reading your blog for too long (a few weeks), but I’m glad I started when I did. If there is one thing my dog has taught me, and is still teaching me, its patience and a broader sense of humor. I absolutely believe in the benevolent leader concept. A number of years ago I had a lab/shepard cross who at 7 years old had an allergic reaction to a pre-surgery drug that took the form of a psychotic episode. It totally broke his bond with me (I handed him the pill) and turned him from a friendly, out-going dog to a fear-agressive one almost over night. Luckily, I had a great trainer who saw through the aggression to the fear and asked me what had happened in his life before I started having problems. She helped me see how the drug reaction, which still had to be followed by a scary surgery experience, left him unable to cope. She gave me the best advice I ever got when she said “he really needs someone to help him make sense of the world right now and keep it in control. From his point of view, someone needs to be in charge and if it isn’t going to be you, then he’s going to do it the only way he knows how — even though he doesn’t want to.” That advice put us on the right track and I was able to give him calm, clear direction and I learned to “listen” to his body language so that I could remove him from stressful situations before he reached his limits. I now have a rescue Great Dane who is a truly cautious canine. I use the same techniques as I acclimate him to new people, places, and experiences. He is so much happier now that he has learned to trust me to help him out. This benevolent leadership philosophy has been mine, too, for the last 15+ years (since Megan and a year later Sparky came into my household). And it worked beautifully and translated readily into positive reinforcement training methods. Megan the late hound mix – who was my soul dog – used to be a street dog in a busy CA city during her first 12 months and had very different ideas about social freedom than I had when she was finally captured. It was not too hard to domesticate her, though, as she was very self assured and sweet with both, other dogs and – much later – with people. Back then, I pretty much picked what seemed suitable from Carol Lea Benjamin’s and The Monks of New Skete’s (who BTW dropped the promotion of the alpha roll shortly after the book came out) training philosophies and it worked fine for us. Sparky, the Portuguese Water Dog, has always been pretty easy going except for – very predictable – situations when he would feel that other dogs were in his space and he needed to tell them off. He is often quite clearly looking for leadership from me – or other humans – and is happiest and most relaxed when there are lots of people around. Enter Ronja my current Beagle Greyhound mix and most all that ever worked before went out the window. During the last three years I have read almost every dog training related book that has been written in the last decade, taken any and all classes available here, tried two behaviorists and still don’t see the light at the end of the tunnel. The benign leadership style works with her – until it doesn’t, that is. It was after many, many situations when it didn’t work that – despite qualms – I tried other approaches to assure Ronja’s and others’ safety. And maybe that is why I got so frustrated with the previous threads looking down at silly examples of the dominance concept. When you are afraid that your dog might bite somebody and when you have tried everything reasonable and nothing worked, it is quite understandable to me – as I have been there – that you will try the more unreasonable approaches as well. Did it work to keep Ronja off furniture to show her her place? No, she just went to other rooms and sat in those chairs and when I closed the doors, the cat couldn’t get to his litter box and peed on the carpet. It only took me a few days to realize that Ronja will do most anything to be warm, above ground and comfortable (in this order) no matter what I do or don’t do – and that it has absolutely nothing to do with how she relates to others. So… as long as she will move off without complaints for humans who want to sit on the couch/chairs that she occupies, she is allowed her beloved chairs. The one and only time I tried the alpha roll was when she went – yet again – after another dog. It didn’t do anything except to make her distrustful of me for the next week or so. Thankfully she is a very forgiving dog. I suspect the right behaviorist/trainer could easily see where I am off in my approach with training Ronja. These instructors are just hard to come by here at the Central Oregon Coast – another lead just fizzled out and I am not quite desperate enough to set out on yet another 6-hour round trip to Portland or Eugene (on my one and only day off) for that elusive trainer that might click with Ronja and myself. “saw you for who you really are, and acted in ways to bring out the best of you” reminds me of one of my favorite Ranger stories. Our house sits back aways from the street so I didn’t realize that all the construction sounds I was hearing came from across the street. Ranger and I set out on our usual morning walk and at the end of the driveway there were a dozen or so people, machinery, vehicles and an excavator digging a big hole. It looked fairly chaotic to me and I would have expected Ranger to be intimidated but as near as I could tell all he saw was people who might pet him and we strode confidently through the chaos with him soliciting petting (successfully I might add) from anyone that got close. We walked to the end of our street and turned up the next to see a street sweeper a couple blocks down heading our way. Ranger kept an eye on it but had no hesitation about walking toward it. About the time we met the street sweeper turned off and we kept going around a curve where Ranger stopped dead and was hanging back, he refused to advance and I couldn’t figure out what the problem was for the longest time. It was garbage day and there were trashcans at the curb but he’d seen those lots of times. Finally, I figured out what the difference was; one house had added five full paper leaf bags to their regular pick up. Since I knew these were no threat I relaxed and we gradually began to make our way toward them. Eventually we got close enough for me to put a hand on one. When nothing happened as a result of me touching them Ranger came to sniff them and figured out they weren’t anything about which to be concerned. I respected his fear and even followed his lead to an extent going on alert as I looked for the “possible danger” he’d spotted. When I figured out what the problem was I showed him that I saw no reason for concern by relaxing from my “alert” and I took as long as he needed to get close enough to show him further that paper leaf bags aren’t a threat. I could have decided that any dog that has no fear of construction equipment is just being stupid worrying about leaf bags and dragged him over to them or punished his fear by yelling or even hitting but I want him to know that he can trust me and that if he’s worried about something he’s never seen before I can protect him and can give him the tools he needs to figure out that it is safe. Interesting what you say about benevolent leadership, rules, boundaries and consistency. We know that one of the things we humans find most stressful is to feel that we have no control over what happens to us – an inconsistent boss who praises one day and yells the next, for no discernible reason, will drive most people distracted very quickly. Could it be that calm consistency gives the dog the sense of being in control, at least in being able to predict what comes next? My dogs have learned that when their food is prepared, throwing a sit or down at me will persuade me to put the bowl on the floor; that waiting for me to give the word before jumping out of the car persuades me to set off on a walk, rather than insisting they get back in the car; that working out the weird games I want to play (Sit, Stay, Down, Wait) encourages me to be fun and gooey and hand out nice treats … and then have begun to generalise. After all, if a really good Down persuades me to feed them, perhaps it is also the way to get me to open the door to the garden, or play that wonderful game with Flat Rat … Perhaps I am able to be very relaxed about status issues because I have tiny dogs, who can be easily controlled if the need ever arises – or perhaps it is because I have always had cats, and am therefore repeatedly delighted that my dogs actually listen to me, and make an attempt to work out what I want and do it! The cats very definitely see it as my job to do all the interpretation, while they judge the results! So glad I found your blog as I read and give your books to my adopters. At my dog sanctuary here at my home, I am trying to use silence as much as possible. It makes me read the dogs. body language and hopefully, makes me be more consistent in my body language. Most dogs here are hounds for adoption or to live their lives here. Hound song, when not in unison, can be very grating yet, when I stay quiet and calm (a deliberate choice, by the way), it allows them to know calm is ok. So, when I come home and chaos breaks out, I simply observe, making myself quietly available for about 10 – 20 minutes, then we move on. I have a TWC female, Sassie, who feels she needs to be Boss, I think. I have set boundaries for her. She is crated when I leave. She must sit or down for meals even in her crate (it is a Great Dane size – she has lots of room). I am also starting to make most of the dogs sit, then accept a piece of kibble from my hand while still sitting, then a pet, then their food all in their crates, all in silence with gentle hands. Seems to be working. Scout, an English Coonhound, is taken aback on occasion. His nickname is “Sir Barksalot.” Once in a while, I bark back at him as if I am answering him. He doesn’t quite know what to do but does get more quiet. I simply find the exercise amusing :). This week has been emotional for me reading your blog. My 3 yr old Cardigan is reactive, and she’s a wannabe. I believe she’s much like Willie, in that I always think she so WANTS the other dogs to like her, but she lacks the confidence to back it up, so most try to ignore her and go find something else to do. She has come so far with her reactivity (initiated by an incident that I perceived to be so small as not important, but she was severely and long-term traumatized by it), I am proud of her. But your post today about what the dogs need from us is something I need to repeat every day. It’s very easy to be tired, irritable because my dog lives with several other dogs and she tries to control them in some cases (the doorway, for example), and I get frustrated sometimes and I will holler at her to lie down instead of doing what I know is right, in helping her to do what she knows is right. I can see in her face that she really does want to be right, and it’s me failing her when she’s wrong. So thank you for this week’s conversation, it has inspired me to try to reign myself in take a deep breath in the moment, and remember how to help my dog, myself, and the rest of the dogs to coexist peacefully. If it’s OK with you, I’d like to post this, with a link to the full post, to my blog dedicated to my insecure dog. 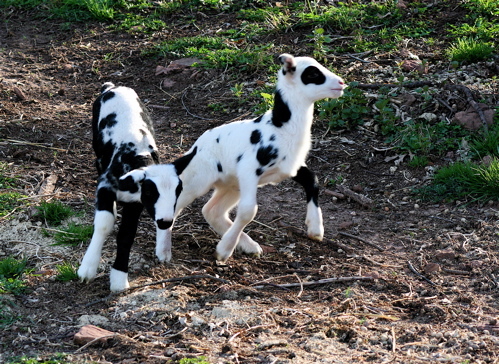 Those two lambs are almost too cute to go to market?!?!?!?!?!?!?!?!?!?!? They look so much like dairy cows or dogs for that matter. Keep those pictures coming! I also just started following the blog, after re-reading ‘For the love of a dog’ and ‘the other end of the leash’ a few weekends ago. I definitely need to repeat to myself the concept of benevolent leadership (helps with my students at school, too), although my dog is so nearly perfect I really have no room to complain. I also LOVE the pictures of all the ewes and lambs–especially the one from a few days ago where all of the black & white critters are scattered on the hillside (including Will crouched down in the grass) and there’s a sliver of red silo (or barn?) in the upper right. If I didn’t love the behavioral info so much, I might say you’d missed your calling as a photographer. I saw this today and I was wondering if you’d seen it and what you thought. For Pike, 2 excellent books if you haven’t read them yet are 1) Click to Calm by Emma Parsons, and 2) a booklet by Trisha, Feisty Fidos. It helps if you’re already familiar with working with a clicker, and know some sympathetic and knowledgeable people who can help set up controlled encounters with other dogs (who have time to meet with you multiple times regularly – that’s the hard part). Good luck! Hopefully you’ll find a good trainer to help. A year and a half ago, I brought home a 7 year old BC with serious fear aggression issues. Your phrase about a dog needing to be able to count on his human to get him out of trouble reminded me of an episode that occurred when we first started making progress using the Feisty Fido techniques. We were walking down the street, approaching a house with a dog in the fenced yard who I knew from experience would bark at us. I felt my dog could handle the situation, so, I kept walking towards the house. But then I realized that my dog was tensing up and I decided to turn and go another direction. The tension immediately left his body as he bounded joyfully in the new direction, and, I swear (warning: anthropomorphizing! ), there was such a look of relief and surprise and trust on his face. I’m new to dog training and this was a huge breakthrough for both of us. I learned to read his body language and trust HIS judgment about what he could and couldn’t handle and (I hope) he has begun to learn that he can trust me to make good decisions for him. It’s an awesome responsibility. Being a benevolent leader can be a struggle. What questions do we ask ourselves? How do we decide what choices are best? Thanks, Mary, for your kind book recommendations. I do have all of Trisha’s (and most DVD’s, too) but had not heard of the “Click to Calm” book. It is on order now. Over the last couple of days I decided to go trainerless for the time being. Ronja and I already went through 5 or 6 (it might have been more and they included behaviorists, as well) with very little progress. She is a difficult dog and it is always hard to change training methods while being right in the middle of trouble. On the plus side, I had almost three years of learning what doesn’t work and on building a solid relationship with Ronja. Having established that all so important connection, we can maybe now go back to the beginning and train away in the problem areas. So… your recommendation is very timely, as I had already decided to go back to the books and re-read about all the – for me – still not really familiar methods (clicker training, shaping behaviors, etc.). My hope is to come up with an action plan for Ronja’s two worst areas (in the yard and on leash). Not, that I haven’t done that several times before – but now that we know and trust each other much more, I have a feeling that things might finally start working better. What makes some dogs more insecure? Are. some born with anxious temperaments? Is it too many traumatic or stressful events? Is it a combination of both? I don’t remember if I read this in Trisha’s books or in Culture Clash by Jean Donaldson: There was a description about how to spot a confident vs. anxious puppy. I loved the explanation that the puppy who bounces back quickly from a scary or unfamiliar thing (ie, umbrella opening) shows better stress tolerance than a puppy who does not show any initial wariness to it. With my Aussies, fear aggression is the number one thing that I have worked hard to avoid. I always step in and body block or shoo away potentially aggressive dogs who persist, despite my dogs’ appeasement or disinterest signs. I also give treats to my dogs whenever something scary or startling happens – barking dogs as we walk on-leash in the neighborhoods,thundering semis, honking horns, etc. This has created the perfect conditioned response in my 4yo Aussie. She actually salivates and looks at me when something startling happens! Thanks again for another great post about benevolent leadership. Again, this won’t work in all circumstances at all, but I’ve found it a good way to create a consequence that discourages fighting, yet doesn’t make your dog afraid of you or gets you into a physical fight yourself. There’s something about “losing space” that seems to have a big impact on a dog, it’s as if they have ‘lost the fight’ somehow, but you haven’t touched them and haven’t done anything to scare them. Anyone else used this technique with success? To Roberta: Silence is golden! I think all of us would profit if we consciously used words less around our dogs. I learned a million years ago that if I wanted to keep things calm and cool it was best to stay as quiet as I could. To Amy: You are right on about both genetics and experience creating insecurity. We know that individuals can be born with genetic predispositions to be easily stressed or easily frightened, and we also know that experience has a profound effect on an individual’s adult behavior. The percentage of influence of each factor can vary tremendously–I’ve seen dogs who grew up in hell and spent 4 years tied to a pole, and yet who ended up social butterflies, as well as dogs who had great starts and yet were emotional wrecks for awhile (can you spell W-I-L-L-I-E?). Most dogs, as is true with most people, are the result of both genetic predispositions and their early experience (including even in the womb). Trisha, your experience of having to leave Willie in his crate while you are gone reminds me of when I was a dog groomer and I started to bring my standard poodle to work with me 5 days a week. She started to show low level anxiety all the time, whining, pacing, things she didn’t ordinarily do. I didn’t think it would help, but I started to bring her only 3 days a week to work with me, and all the anxiety stopped. It was a surprise to me to realize that being around me 24-7 wasn’t in her best interests. I came to understand her better later, and now know she’s like me and has “social burnout” if she doesn’t get her downtime. I’d just like to thank you again for this blog and everyone for their great comments. The more I read and learn the better I understand what’s happening with Ranger. I’m very lucky in that he’s a pretty calm confident guy and I suspect even if I knew no more than how I wanted him to behave–what behavior he should exhibit to have good manners–he’d still be a pretty great dog. But as I learn more and more about how to listen to him/read his signals and what I can consciously do to make things better for him the better our relationship becomes and the deeper our bond. On our walk this morning we along a busy road and a big semi-truck roaring past applied his air brakes just as he came even with us. It hurt my ears so I know it must have been very unpleasant for Ranger. All he did though was shy about two feet away and look at me to see how I was dealing with it. I said something like “yep, loud noise, walk on” and that was that. Without this blog and all the other reading I do I’d probably have done the same thing but I wouldn’t have recognized that he was looking to me for leadership. I like understanding what it is I’m doing and why it makes a difference. Thank you. Copper, I am pretty sure, has a bit of a predisposition to separation anxiety. We managed our departures carefully when he was young and never saw major problems, but one of his big triggers to having that wile-eyed look when we returned seemed to be leaving him alone in too big of a space. I am not sure why, but we had to go very slowly with Copper in allowing him the freedom of the house when we were gone. It seemed like the bigger spaces just overwhelmed him at first, even though he was home with our other dog and the cat. He was crated until after he was two whereas out other dog was always very good in the house alone didn’t need to be crated much after she was about 10 months old. I suspect with her it was because no humans had ever really paid attention to her until we rescued her, and thus they weren’t as huge a part of her world as people were for Copper who’d been whelped in his breeder’s living room and given a great start in life with lots of loving people around. Very interesting point about human attachment and separation anxiety, Alexandra. I am at home most of the time, so my two dogs are used to having my company, and if I am out for an hour or two, they usually have each other. I have made a conscious effort to get each of them to be relaxed about being at home alone when I am out with just one dog, but I have a disabled neighbour who needs to sleep whenever she can, day or night, so am very, very careful about letting them make a noise – this has made it a difficult one to manage! I found that with each of them there came a point at around 9-10 months old when they naturally became less clingy – wandering off to sleep in another room, roaming a little bit further from my side on walks, and going out of sight in familiar territory. Up till then being alone even for a few minutes was obviously upsetting, and led to crying and even howling. After that point they yipped for a minute or two, then settled down with a Kong. I know the standard advice is to get a pup used to being alone as soon as possible, but I do wonder if it is not much easier and less stressful to wait when possible until the pup is ready for more independence.